Thank you Stonyfield Organics and prAna for sponsoring today’s post. As always, all opinions are my own. 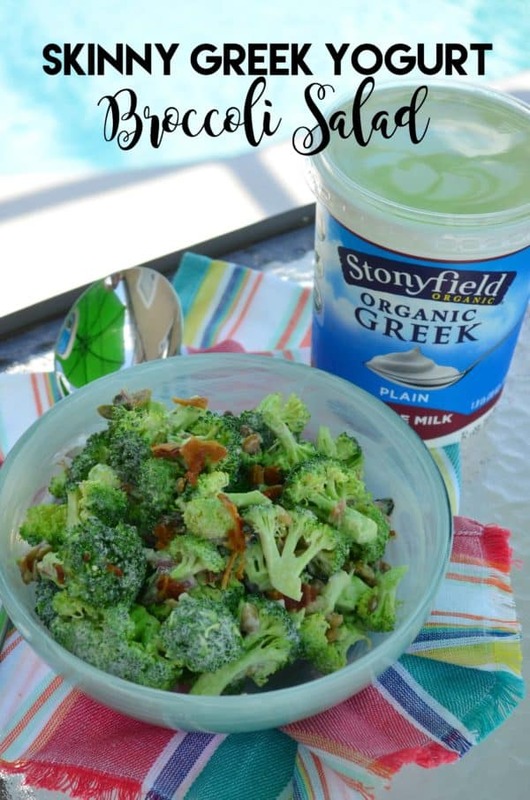 Learn the secrets of how to lighten up your favorite summer side dish and make my recipe for Skinny Greek Yogurt Broccoli Salad! No one will ever know the mayonnaise is missing! 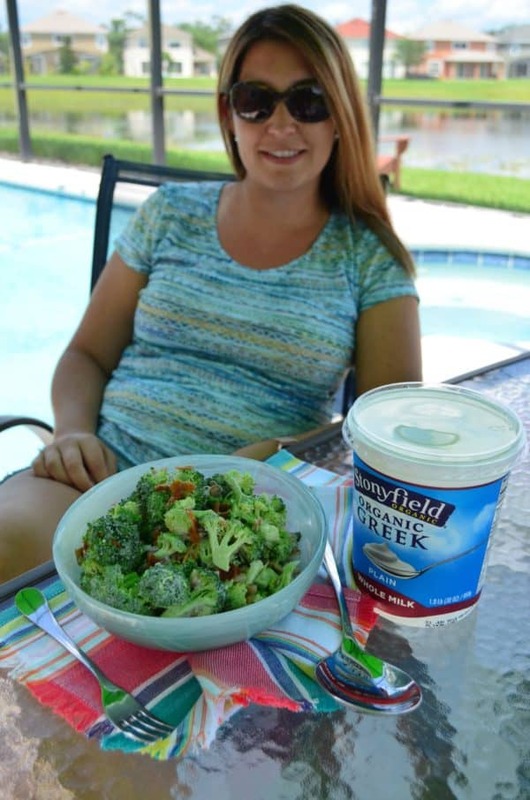 I’m so excited to share my recipe for Skinny Greek Yogurt Broccoli Salad today. I always love when I can make a favorite summer side dish and lighten it up. Even better when not a soul realizes that this typically mayonnaise laden side dish is actually Greek yogurt! My friends at Stonyfield and prAna have asked the Clean Plate Club what satisfies our summer cravings? Both in the refrigerator and our wardrobe! I’m definitely craving lighter side dishes that don’t weigh me down and that are fresh and vibrant. That’s why I chose the Stonyfield Organic Whole Milk Greek Yogurt. I’ve also been on a shopping kick lately. I don’t shop often for myself, but when I do I feel like I go through a good few weeks of refreshing my wardrobe piece-by-piece. I’m in love with this beautiful, sustainably made Garland tee from prAna. It’s bright and vibrant just like my broccoli salad. Even better it’s lightweight and super soft! Now that we own a house with a pool, we find ourselves out in the pool daily. We are also finding that we are entertaining a lot more with friends over all the time. So I’m always whipping up appetizers, lunch, or even dinner on the fly. 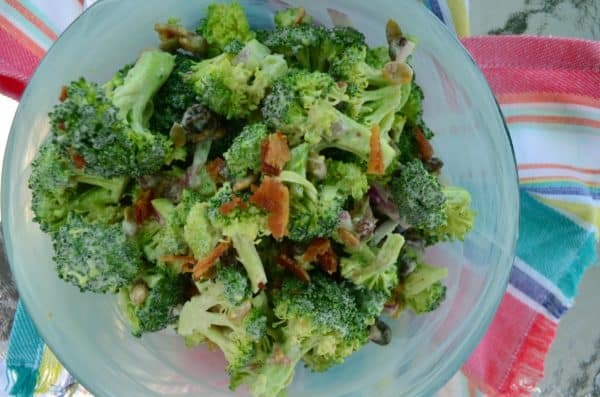 All of the ingredients in my Skinny Greek Yogurt Broccoli Salad are ingredients that I almost always have on hand. I can put this salad together before friends come over to swim. Then stick it in the refrigerator to chill and pull it out when we are ready to eat. And like I mentioned above, even my friends who could bathe in mayonnaise (I know, so so gross) have absolutely no idea they are eating a salad with Greek yogurt in it! I’m doing them a favor and they have no idea! It’s our little secret, okay? Want to satisfy your craving this summer? My friends at prAna are offering Katie’s Cucina readers a 15% discount code valid until July 1st! Use the code SCS16KAJA on your next purchase! *Not valid on gift certificates or other offers! 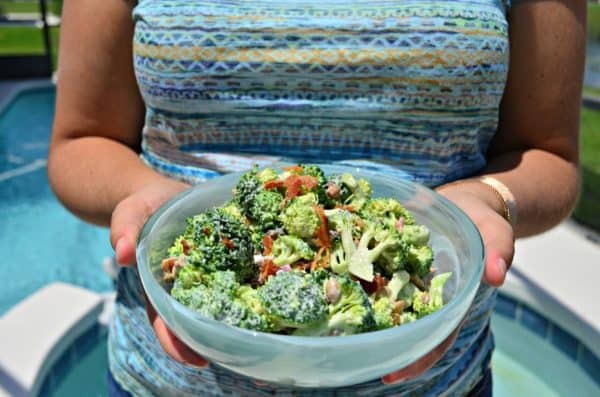 And don’t forget to make my Skinny Greek Yogurt Broccoli Salad for your next summer gathering! In a large bowl combine the Stonyfield Organic Greek Yogurt, sugar, and apple cider vinegar. 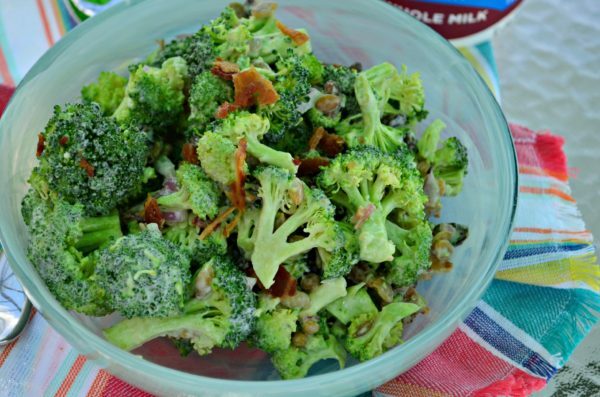 Mix well, then add the the chopped broccoli, red onion, and raisins. Mix well, then add in the pepitas and crispy bacon. Mix well again and then refrigerate for at least 30 minutes before serving.